Several suicide bombers penetrated the security of Kandahar Airfield on Tuesday, 8 December 2015, barricading themselves in an old school building that now contains shops, and sparking a battle with Afghan soldiers that lasted for many hours. The Afghan Defense Ministry stated that 50 civilians and members of the security forces had been killed, along with 11 attackers, while at least 35 people were injured. The Taliban claimed responsibility. The attack was co-ordinated just hours after a "Message to Obama" was posted on a video site by the Taliban, warning U.S. troops of upcoming attack. 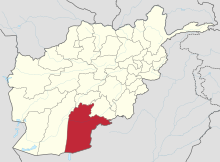 ^ a b "50 killed in attack at Afghanistan's Kandahar airport". CNN. 8 December 2015. Retrieved 8 December 2015. ^ "Kandahar airport death toll jumps to 50 after Taliban attack". BBC. 8 December 2015. Retrieved 8 December 2015.